When designing a structure, you as the structural engineer must keep in view the big picture. What are the ‘vital signs’ of the structure? What do you tell your supervisor when they ask for a quick status? ETABS, like other analysis programs, doesn’t provide a quick answer to these questions. 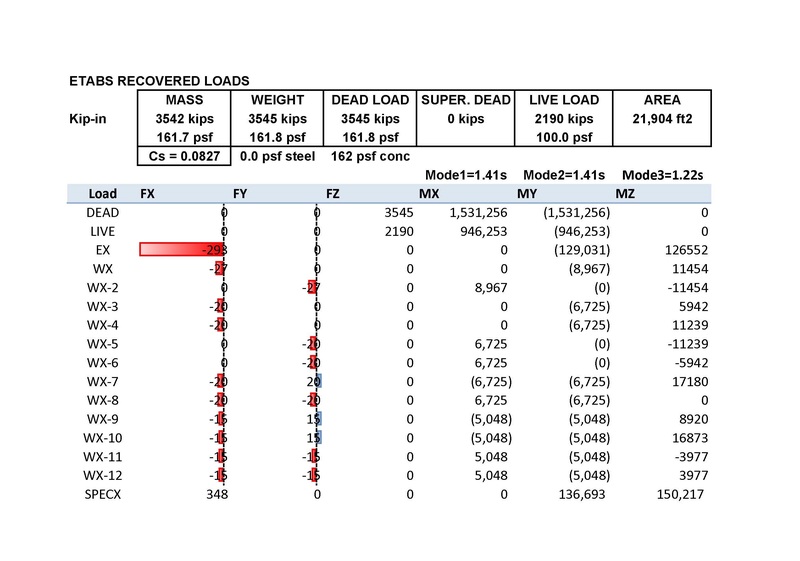 Enter the “Recovered Loads” spreadsheet, which provides a 30,000-foot view of your building on one printed page. Instructions are found on the first tab of the spreadsheet. Questions? Let me know via the comments. This entry was posted in ETABS, software, tools. Bookmark the permalink. You have done an incredible work here, thank you very much. However it seems it doesn’t work with my version of etabs which is 13. Is it me doing something wrong or this spreadsheet works with a previous version of etabs? Tympos: You’re in luck – I have updated the Recovered Loads spreadsheet to work with both v9 and v13. I will post it here soon. Dear Dan, have you posted the new file working with etabs 2013 somewhere? If not it would be extremely appreciated to do it here. Thanks in advance. Very nice blog, a lot of interesting topics. Regarding the excel file, you might want to change the screenshot on the Instructions page, to have all Load Cases selected, else it doesn’t work as supposed to.